Place salad greens in large salad bowl. 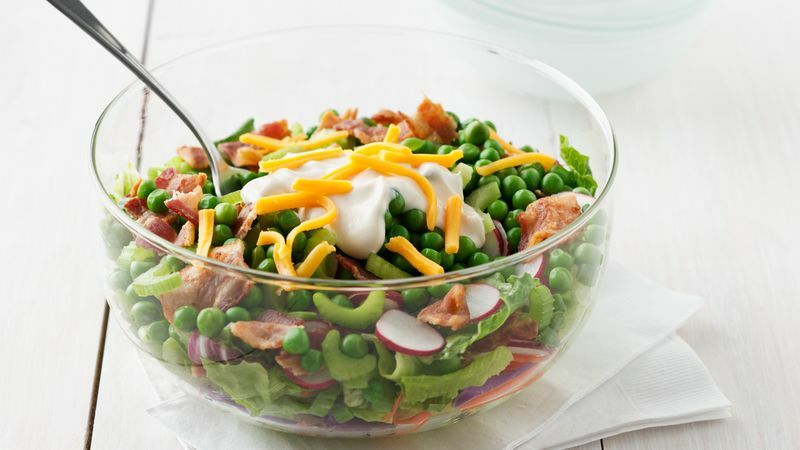 Layer radishes, onions, celery, bacon and peas on salad greens. Spread mayonnaise over peas, covering top completely and sealing to edge of bowl. Sprinkle with cheese. Cover and refrigerate at least 2 hours to blend flavors but no longer than 12 hours. Just before serving, toss if desired. Store covered in refrigerator. Keep salads cold at picnics or other outdoor events by placing the serving container in a bowl filled with ice. Show off this pretty salad in a clear glass or plastic bowl. Use reduced-fat mayonnaise and turkey bacon for a leaner look to this salad.